Debuting at the Fender Showcase at the 2016 NAMM Show is a one-of-a-kind guitar from Master Builder Yuriy Shishkov called the Music Repeater Telecaster. 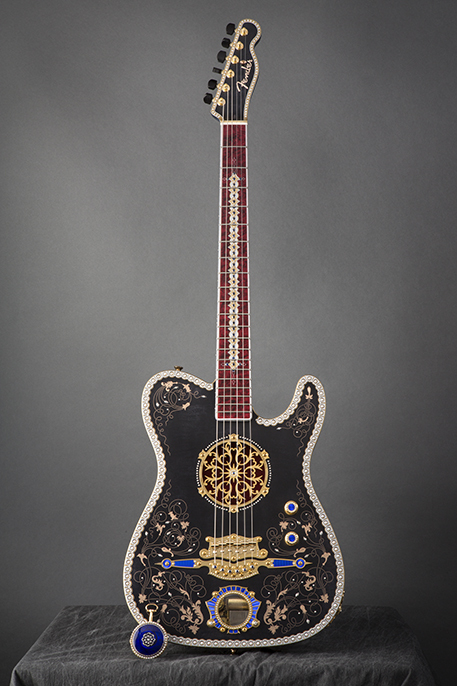 The Music Repeater Tele contains 1,005 diamonds, 38 sapphires and 325 natural pearls, in addition to 18-karat rose gold wire inlay and 18-karat rose gold sheet inlay. What’s more, the Repeater Tele features custom-designed electronics with a “pan” control of the guitar. Click here for more in-depth looks at the Fender’s new releases at the 2016 NAMM Show.